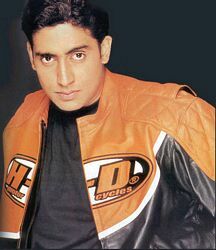 Movie Synopsis: The story is about two guys Kunal (Abhishek Bachchan), a photographer and Sameer (Abhishek Bachchan) a nurse. They meet while they are searching for an apartment and end up picking the same apartment to rent. But the owner wants to rent apartments to girls only since his niece, Neha (Priyanka Chopra) stay there also. Sameer gets the idea to pretend to be gay lovers with Kunal to see if the owner will agree to let them stay. The plans works buy both of them end of falling in love with Neha. Movie Review: The movie is not the typical Indian movie story and hence could do well, the subject is also a little mature for India. The movie does bring out the subject of homosexuality to main stream film in India. The movie is well directed and Director Tarun Mansukhani is here to stay, plus the music by Vishal Dadlani and Shekhar Ravjiani is perfect and energetic. Both John and Abhishek have acted very well and have delivered a great performance. Again Priyanka looks great and now has given back to back good performance.